For some reason, my house seems to have become infested with cats. Not the real variety, though there is one real one who thinks it owns us and deigns to live in our household and demand attention, food, worship and the Head of the Household's chair (even if he is trying to sit in it). No, I mean cats of the stuffed and knitted variety. Two of them in particular have been hanging out in the lounge room the last few weeks demanding their turn in the spotlight so they get to be the stars of this post. Here are Flat Cat and Ami. I have to admit I didn't knit Flat Cat. He is the Head of the Household's work. My mother in law, having only sons, taught them all to knit. Occasionally (I think just to prove he still can) the other half knits something. I did however sew Flat Cat up and stuff him. Flat Cat's very existence appears to periodically offend the real cat and so Flat Cat required some injury repair and rehabilitation recently after the cat decided to 'kill' him somewhat enthusiastically and leave gaping holes in his limbs. Oh well, it gave me a chance to practice my darning skills. (Thanks to my Oma and my mum for having the patience to teach me to darn. I still darn the work socks that seem to develop holes in the toes whilst still brand new everywhere else). Darned arm: Complete with Gravy spot due to son photographing cat on dinner table after a roast dinner! Ami (short for amigurumi) was my first ever attempt at making an amigurumi. "Amigurumi is the Japanese art of knitting or crocheting small stuffed animals and anthropomorphic creatures. The word is derived from a combination of the Japanese words ami, meaning crocheted or knitted, and nuigurumi, meaning stuffed doll" (Wikipedia). Amigurumi are typically crocheted tightly in a spiral or in the round. When I was hunting the internet to find a pattern for something cute, I kept coming across this particular cat, Amineko. 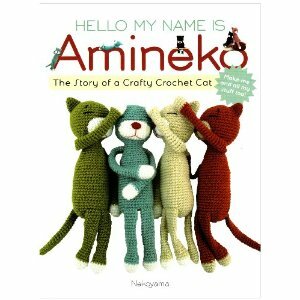 Ami means crochet and Neko is cat in Japanese. Two things put me off initially though, the pattern was in Japanese and whilst there was an English translation it used diagrams and I'm used to written instructions. I'm also nowhere near as competent crocheter as I am a knitter. However, I figured the only way to see if I could do it was try. Here is the Japanese Language Home page for Amineko's creator, Nekoyama. A link to the Amineko pattern can be found on the right hand side of the page (it's in English). Nekoyama asks that people who link to the pattern don't link to it directly and I'm respecting her request. The English page has diagrams and clear photos of every step of the process can be found on the Japanese page. Whilst there are other people on the internet who have translated this pattern into English (and are often trying to charge for it), we should respect people's copyright and use the original. Part of the charm of Ami is how he is stuffed. Only his hands and feet are stuffed with the rest of the limbs including his tail left un-stuffed to allow him to be poseable. The base of the body is stuffed with pellets which allows him to easily sit on any surface. Cara is evil, hopefully flat cat and ami aren't so much. The knitted ones are much less high maintenance (and cheaper to feed). Strangely enough Cara does not dislike Ami and has been known to cuddle up to him.